Sometimes, robots and postmodern creatures are referred to as "canners" (ie. Asimov's I, Robot). So I am using this painting for IF's topic this week, canned. I finally finished this, in the nick of time to enter it into a show (in New York City!) that is asking for work that is totally imaginary, that is, that wasn't made using references. I'm not holding my breath about getting in. Shows like this are a longshot at best, but it is unusual to find anyone that makes the distinction between work that is copied from photos and work that is purely from the artist's brain, so I had to try. The title I finally settled on is Prelude and Fugue. I hope Claire Corriveau will approve. This piece is really interesting and definitely embodies a post-human element. It seems as if normal, nurting hands of a mother are mixed with the robotic and mechanical hands she probably wishes she had to cope with the strain of raising a new child. Although artificial limbs would seem to represent something cold and unemotional, I think in this case it is opposite. It shows the mother's desire to be endlessly giving and supportive, even if it takes so much out of her. This piece is amazing and certainly portreys a post-human element. 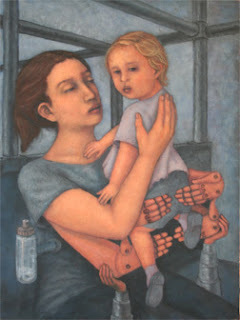 What is truly interesting about this piece is that the artificial parts of the woman are holding the child with care and yet their eyes are turned away from each other, making them seem disconnected. When I think about this piece in relation to the theories we have examined in class, I immediately think of post-humanism and psychoanalytic feminsim. The extendable/mechanical arms clearly portray post-humanism. The fact that these arms are assisting the mother in caring for the child, in what appears to be a very nurturing way, represents some of the ideas of the psychoanalytic feminist theory. Overall, it is a very interesting piece to interpret. i believe this piece has strong post human elements.you get the feeling that the women in the piece is not up to the task of raising a child. the extra hands represent the fact that the women needs extra support in order to care for her child. Great painting. acrylic board is really smooth right? I have such a hard time with it. I guess I'm too use to canvas. Great illustration. Oh, and I haven't heard that before about robots also being called canned. Well, you've prove to them that you CAN, and you CAN beautifully! amazing and I learned alot too!